- Trim duck breasts if necessary. Place in pan. - In a separate bowl, mix red wine vinegar, red wine, olive oil, bay leaf, thyme, and shallots. - Season with salt and pepper. Pour over duck and marinate for 30 minutes. - Preheat oven to 350º. - Season plums with pepper. Place in pan and add red wine and red wine vinegar. Hold aside. - Grill duck until cooked to desired doneness. Brush with marinade while grilling. - Reserve leftover marinade and heat on stove until it boils. Continue to boil for 1 minute. Hold aside. - Take duck off grill and let rest. - Divide arugula into 5 portions and put on plate. Slice duck on the bias. 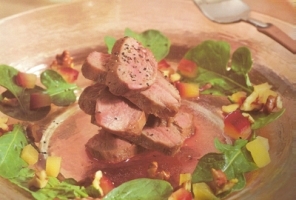 Place duck and plums on top of arugula. - Sprinkle with blanched walnuts. Drizzle cooked marinade over duckling, plums and greens. - When in season you can substitute figs for plums and chestnuts for walnuts.